I am happy to have my third puzzle in the New York Times. I wrote this puzzle after seeing the documentary RBG. I am glad to debut her nickname, NOTORIOUS RBG. Other answers I like are EVILQUEEN, DREAMTEAM, KOREANAIR, and the talented actress UZO Aduba. My least favorite answer is LEOIV, but a 5-letter word ending in V did not have many good alternatives. Sorry about that one. It was just a couple of years ago that Debbie wrote to me, asking for advice on creating NYT-quality crosswords. Look how far she's come! Great to see her second Saturday puzzle – it's so rare for women to land that Saturday slot these days, given 1.) the intense competition, and 2.) the sheer number of men submitting themelesses. Well done! I loved so many entries in this one; so colorful. TRANSYLVANIA as a place where you might go out to get a bite. The NOTORIOUS RBG. (She's a serious badass!) A refreshing-sounding drink called a SEA BREEZE. 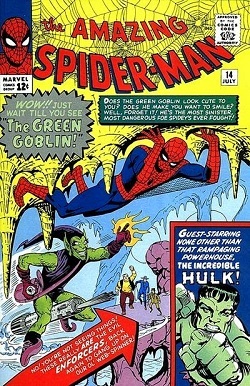 And literal color in the GREEN GOBLIN. I don't know that I'd call him Spider-man's archenemy – I'd go with Doc Ock myself – but there's no doubt that Gobby is right up there. That's starting to feel more like a trivia contest than a crossword. I'd have favored a bit more crossword glue, maybe a partial or something, in order to reduce this count. The AZIZ / UZO crossing was particularly tough. Not sure it's 100% fair; too easily setting up the solver for failure. But overall, a solid and entertaining Saturday offering, with even some extra bonuses in quality shorties like GONZO, BUSHWA, and ENNUI. The grid uses 23 of 26 letters, missing CJX.